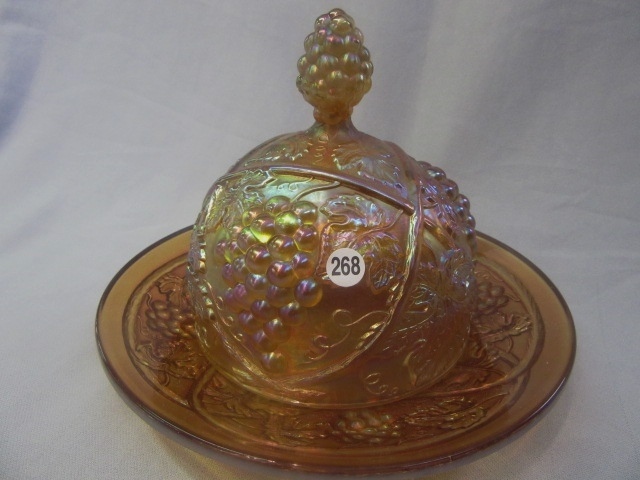 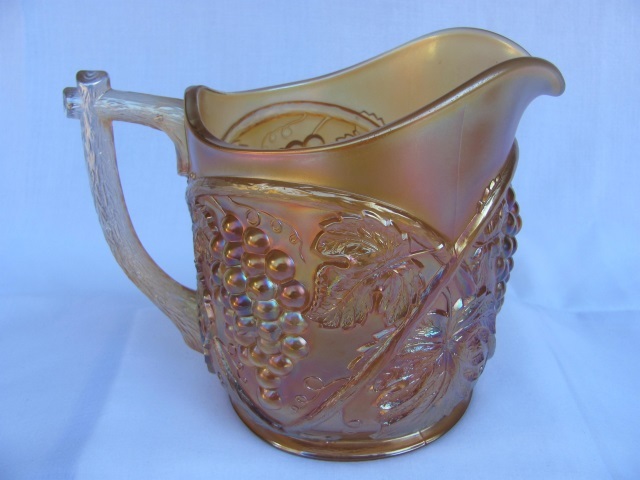 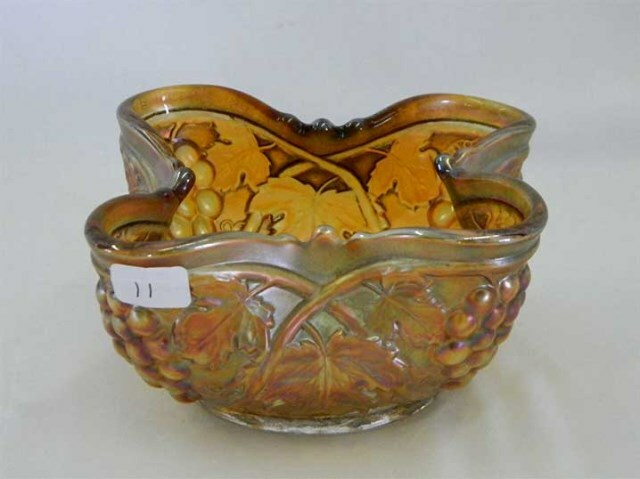 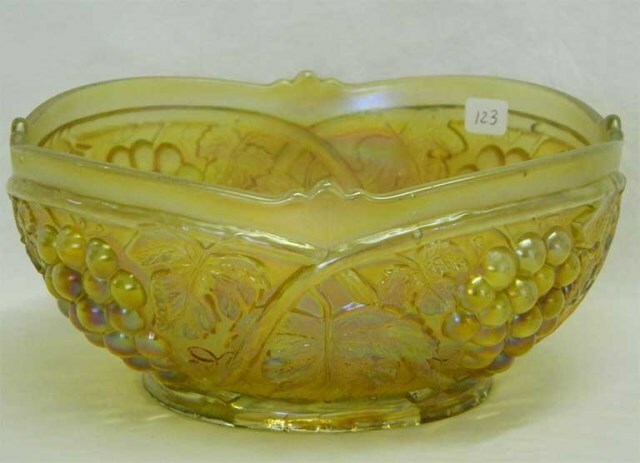 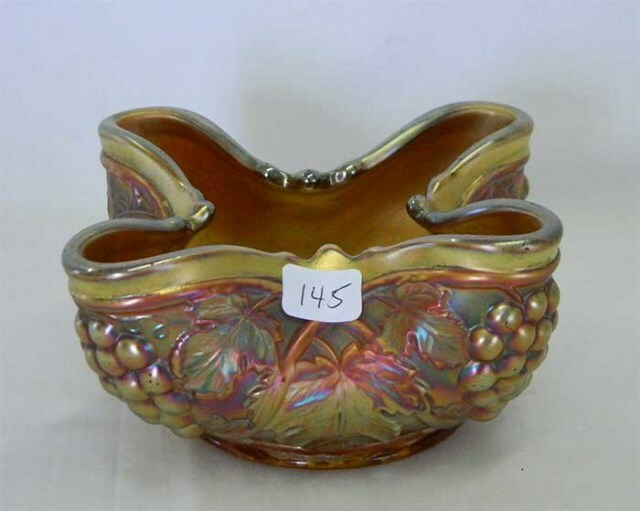 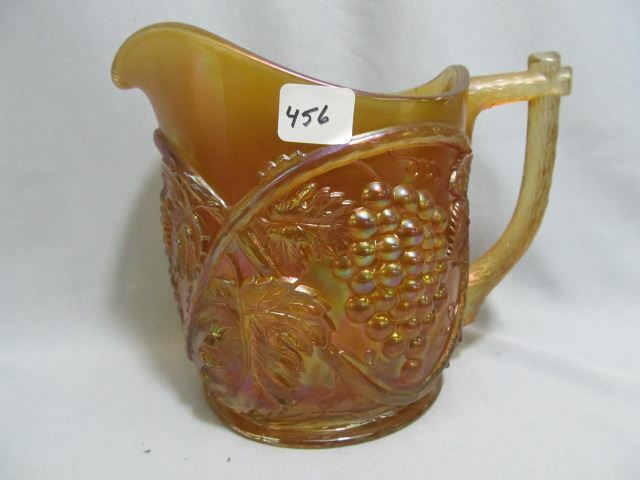 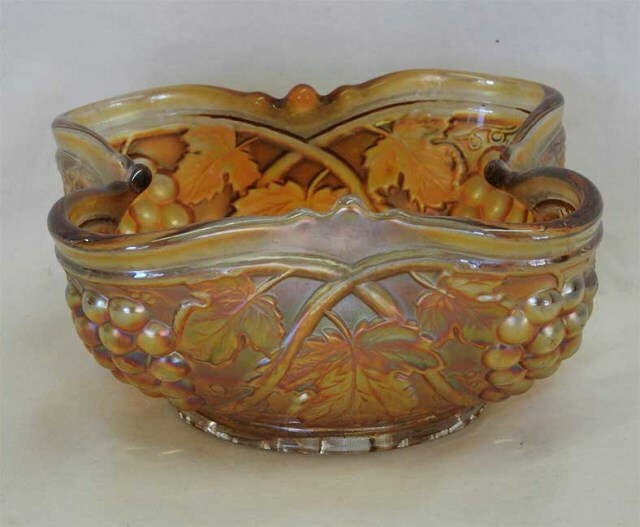 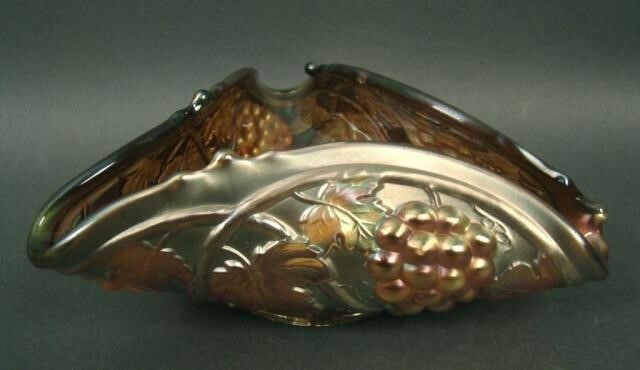 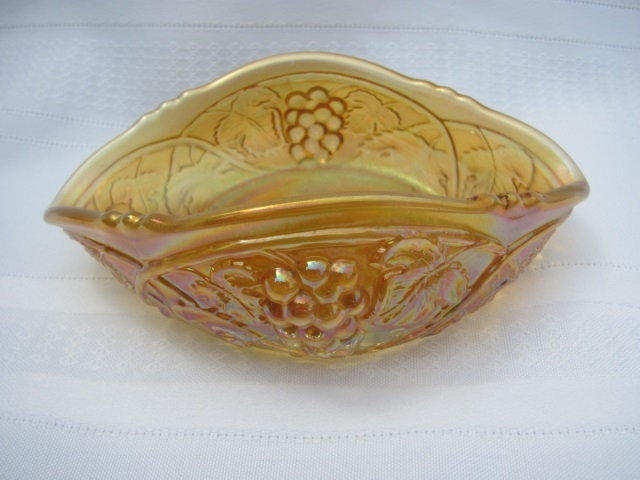 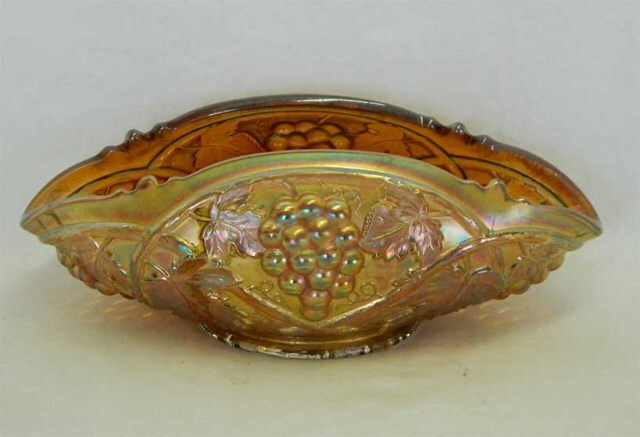 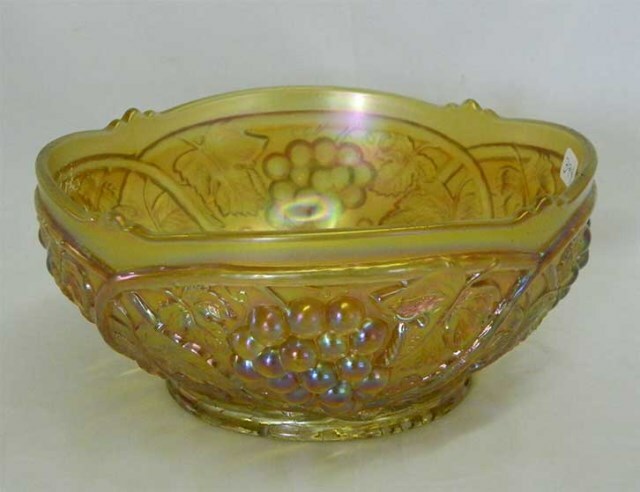 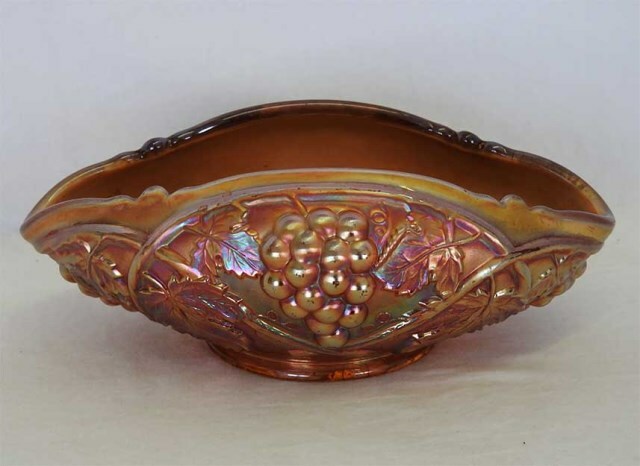 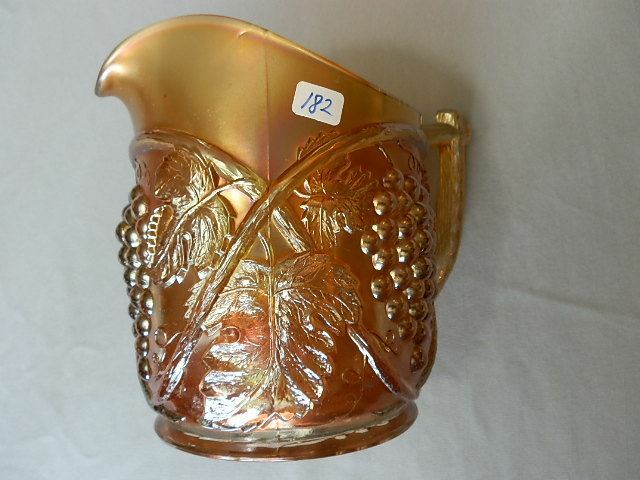 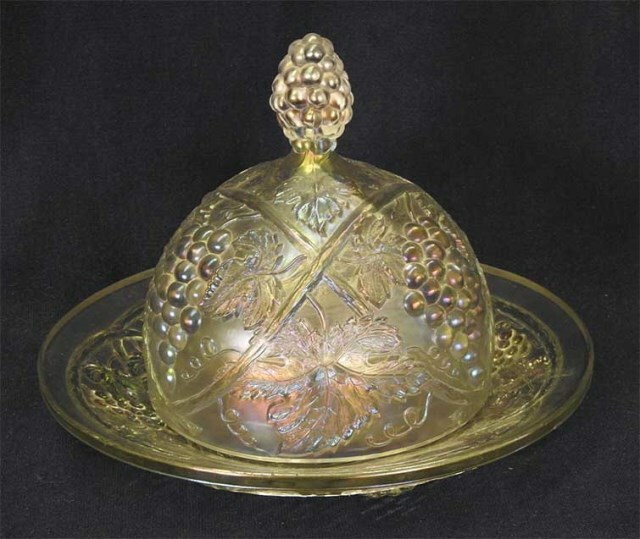 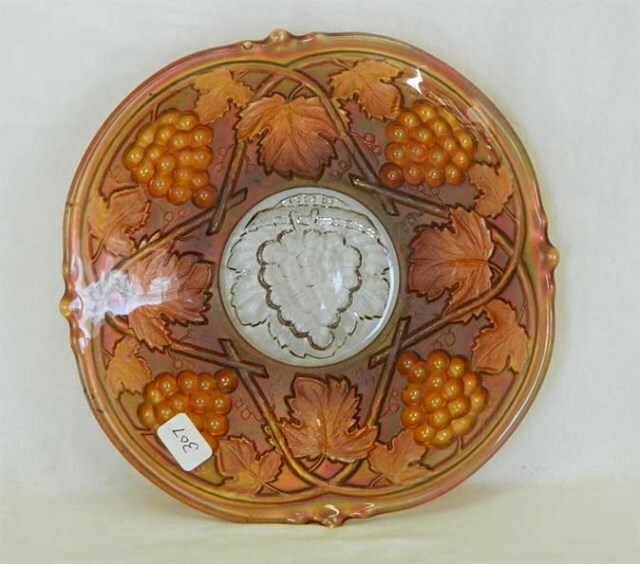 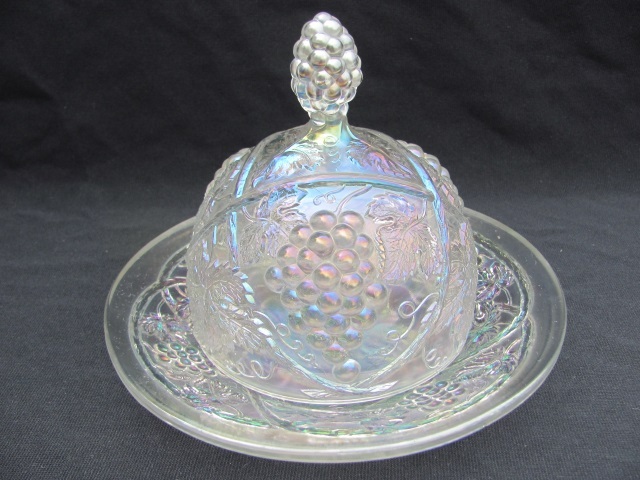 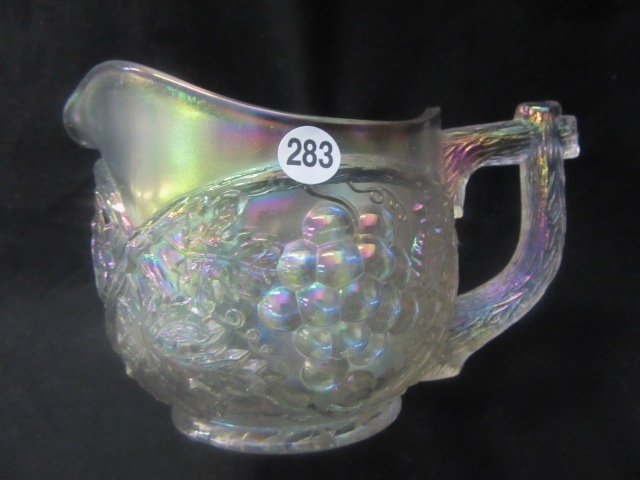 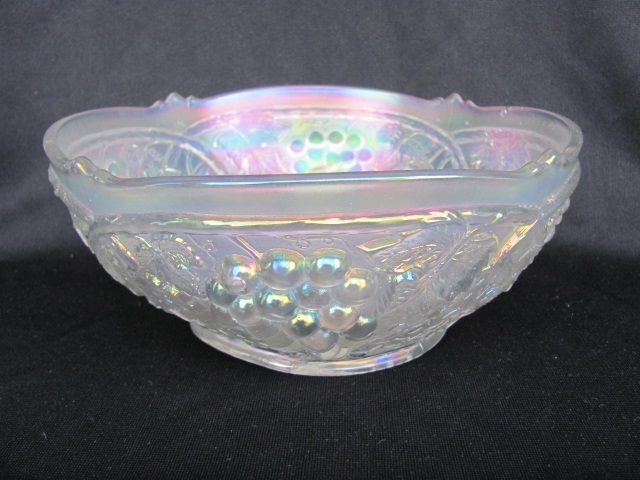 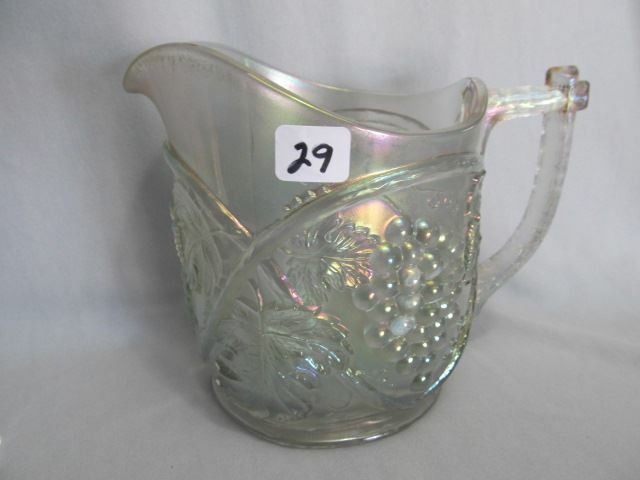 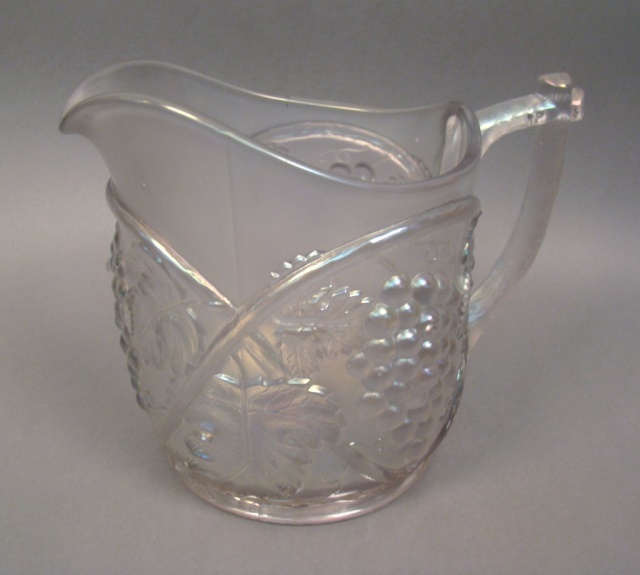 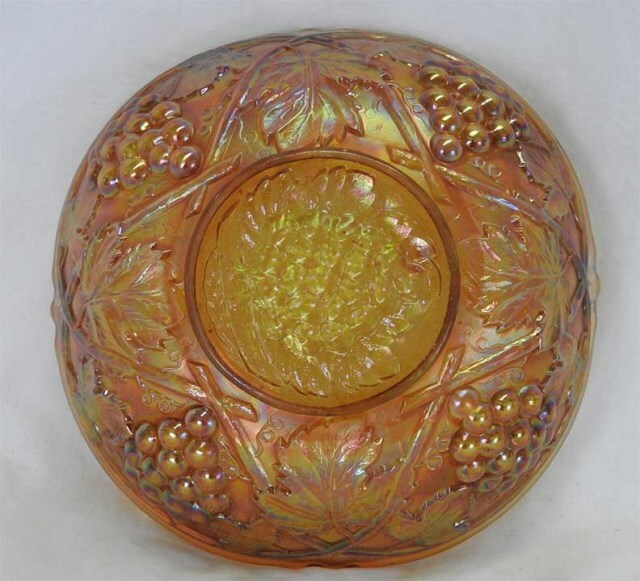 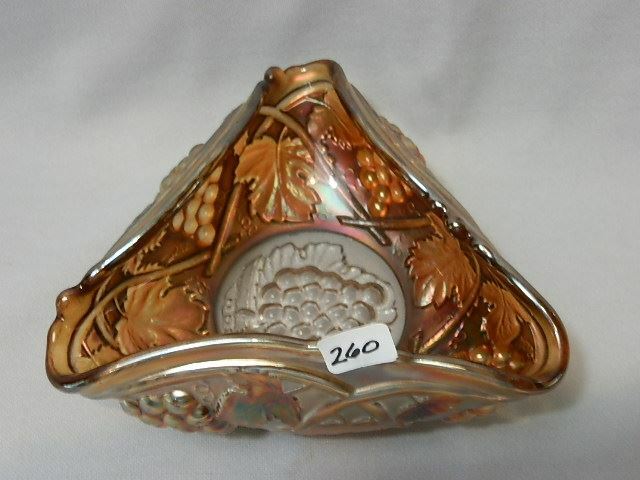 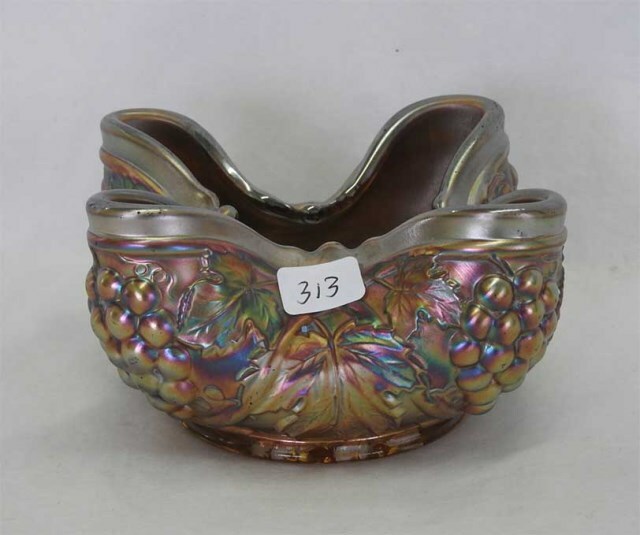 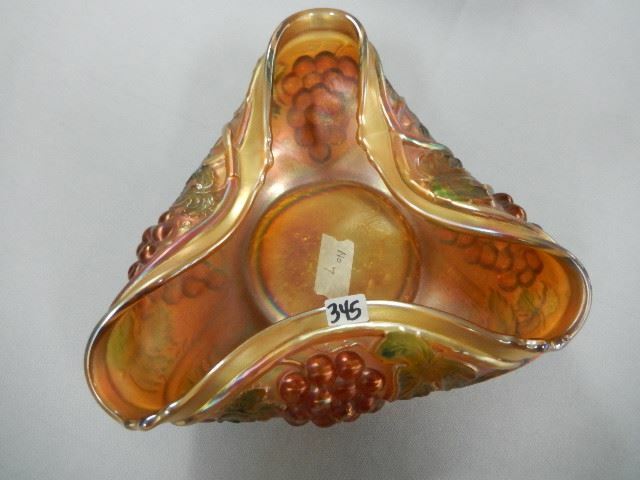 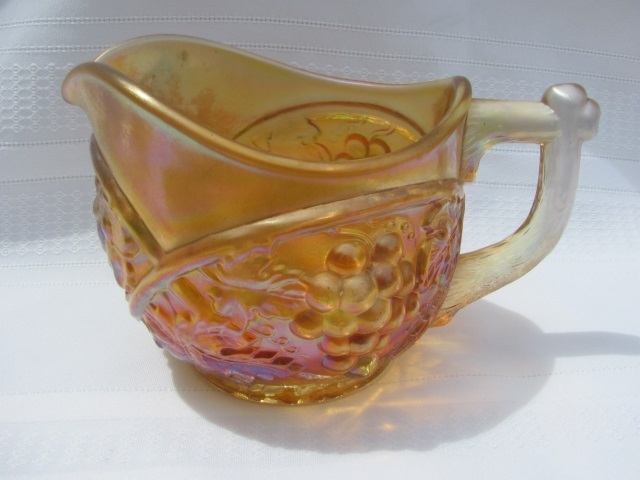 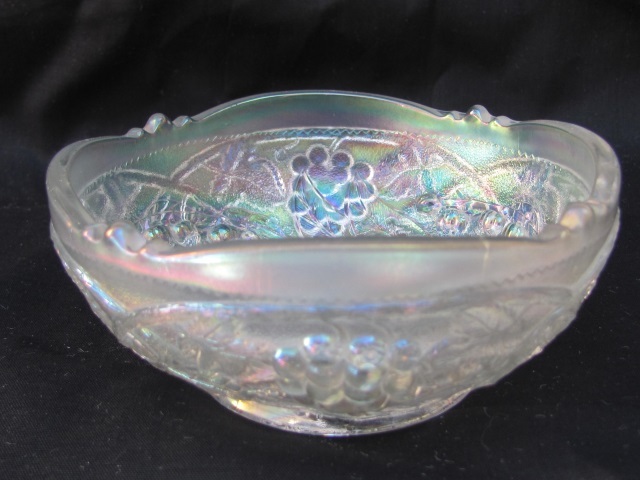 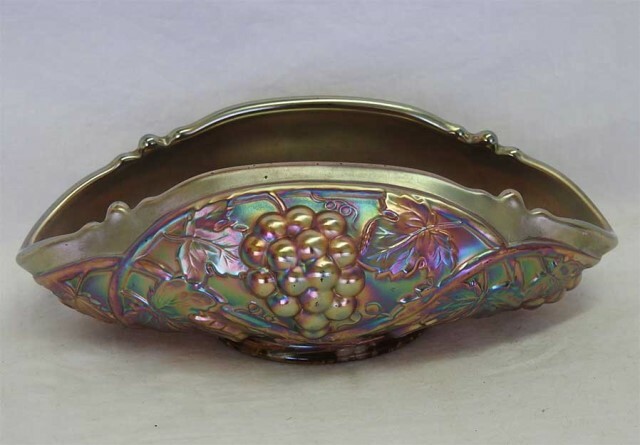 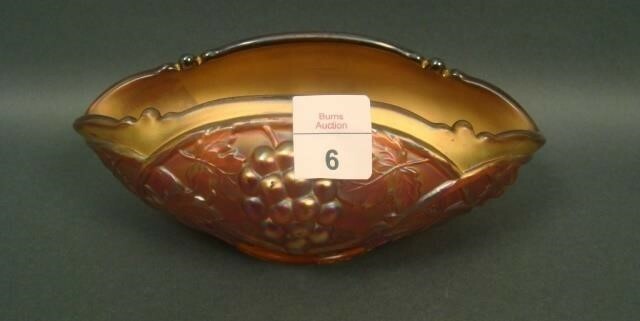 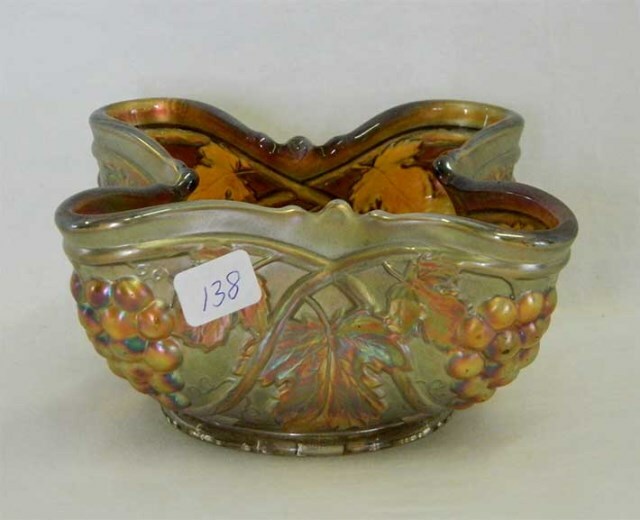 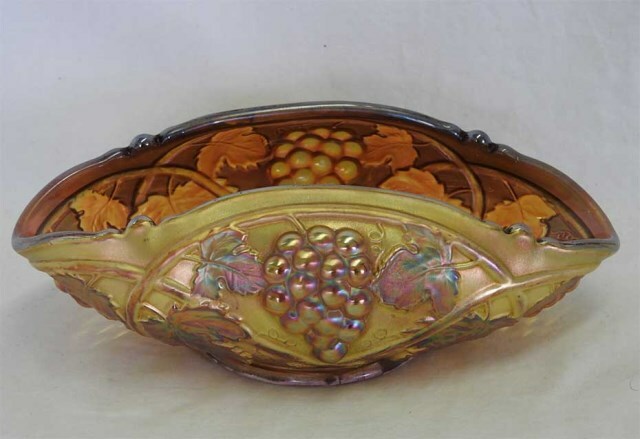 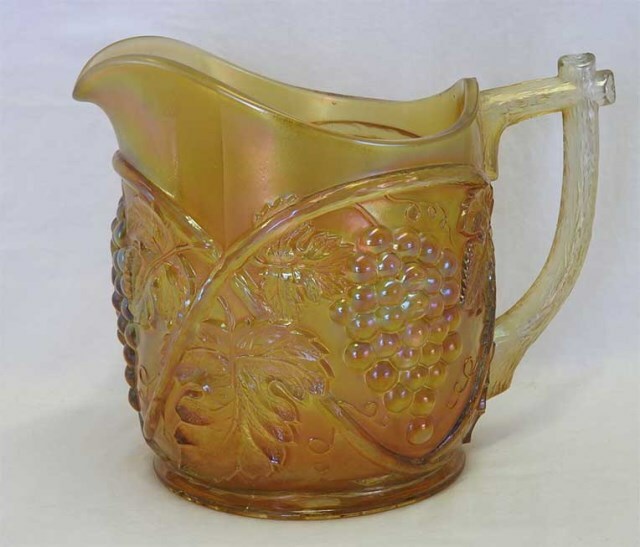 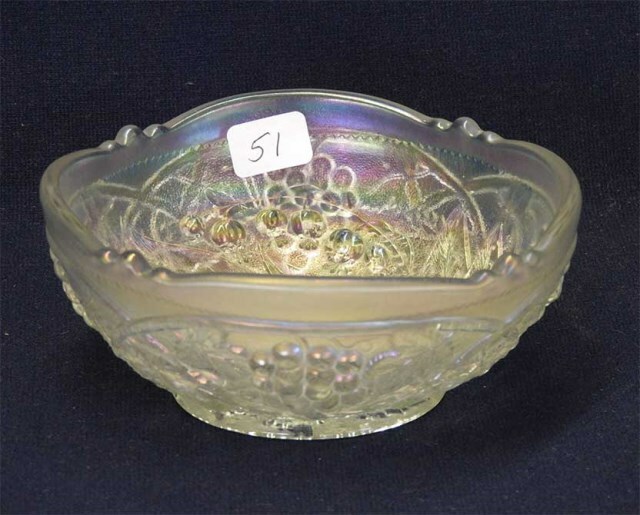 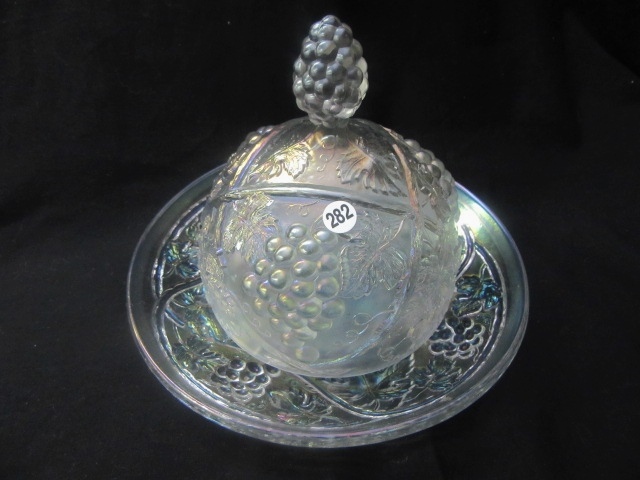 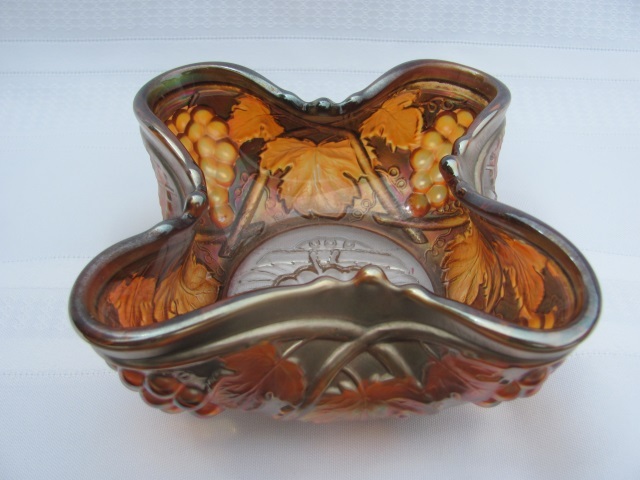 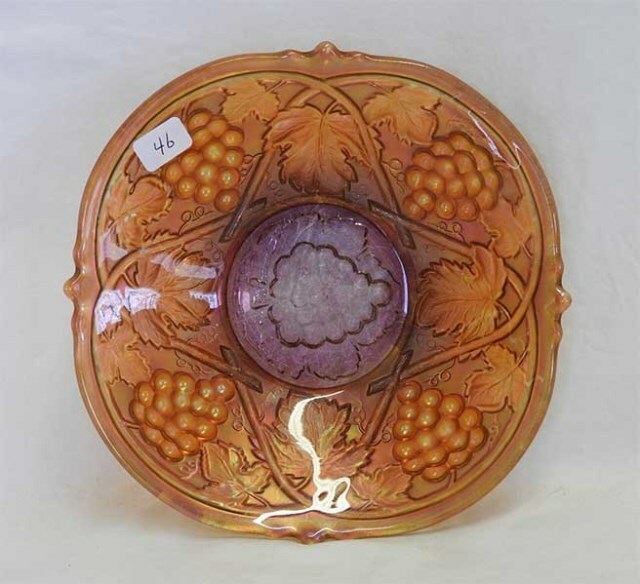 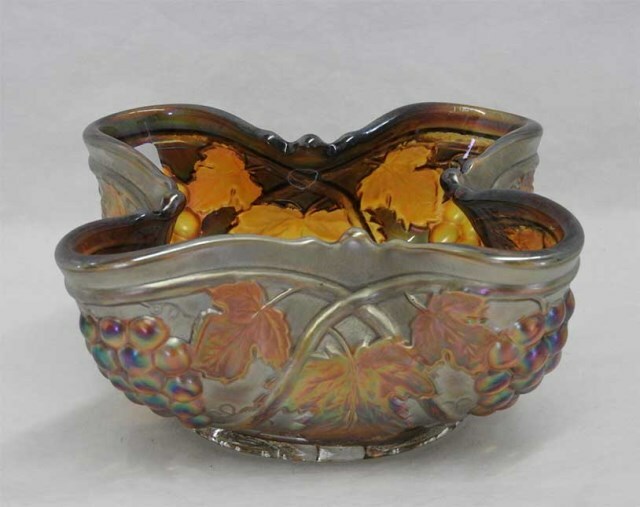 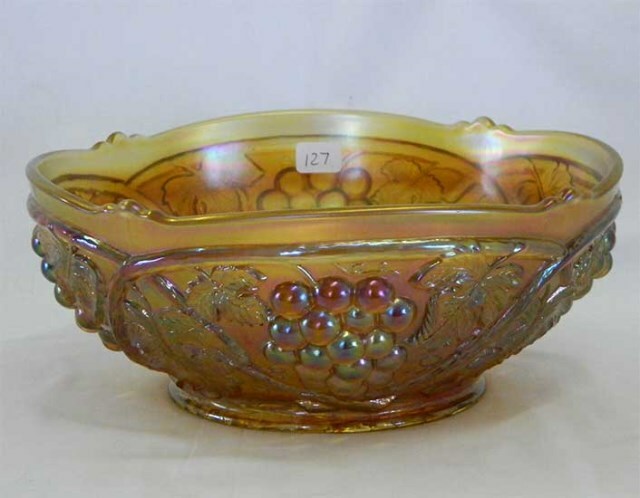 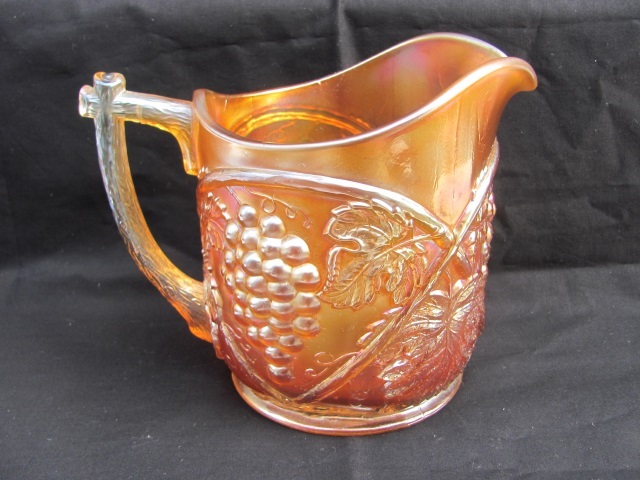 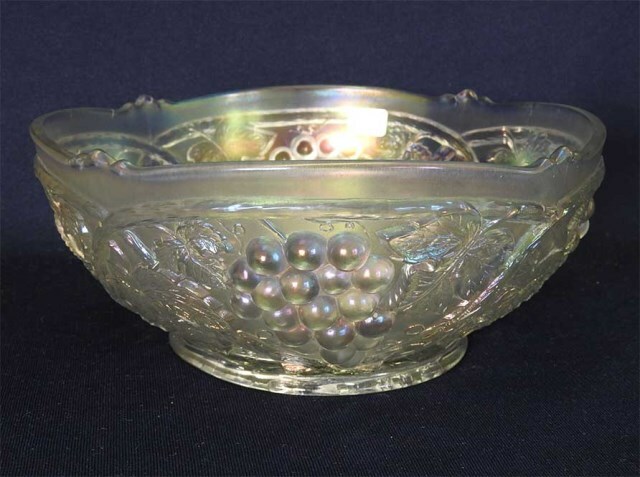 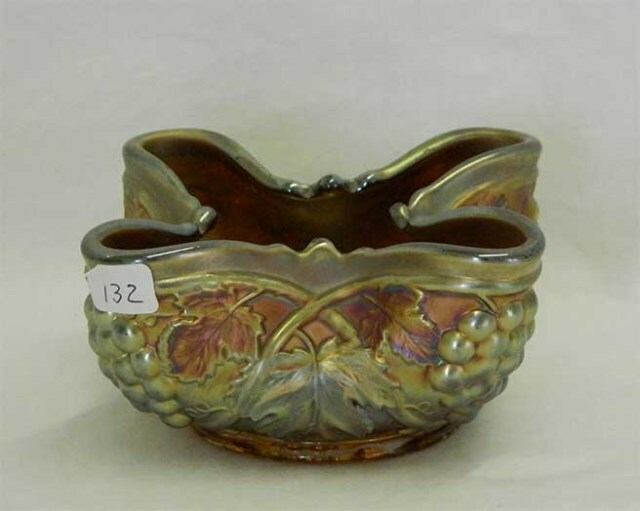 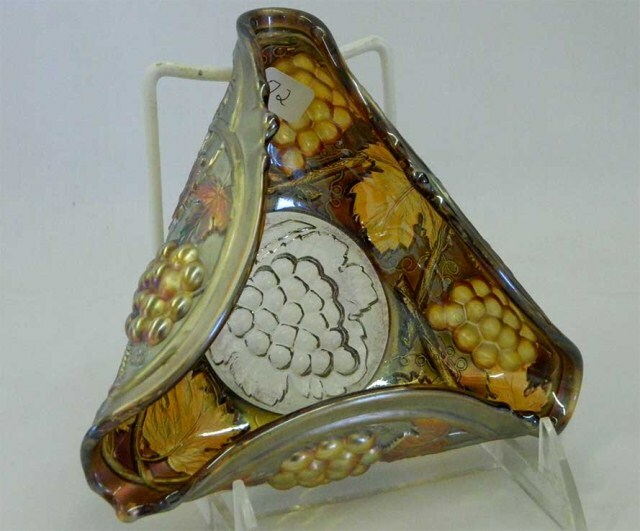 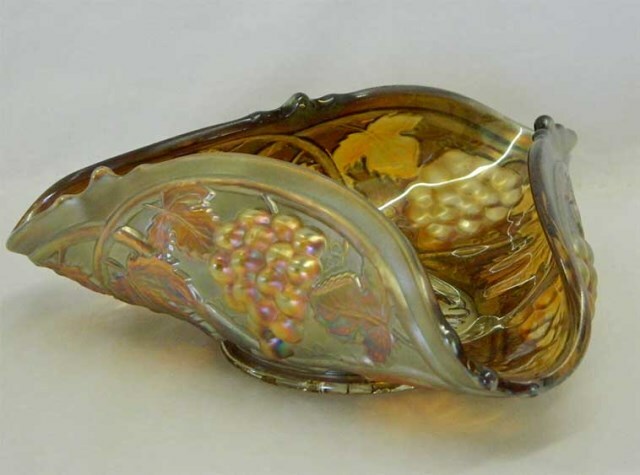 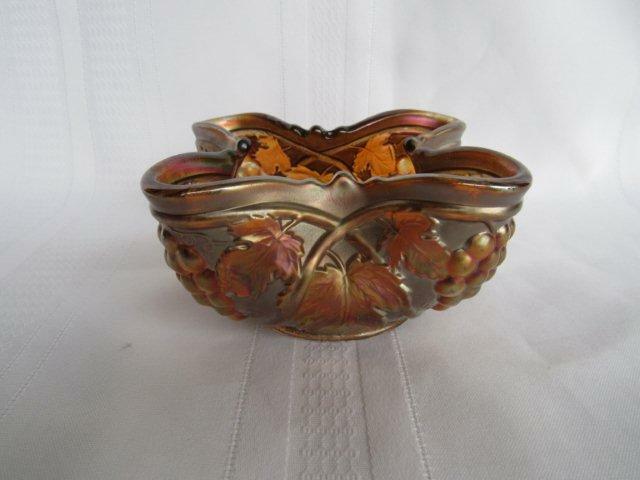 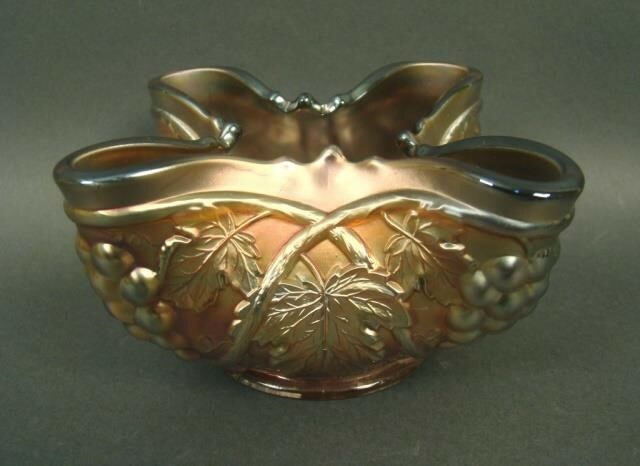 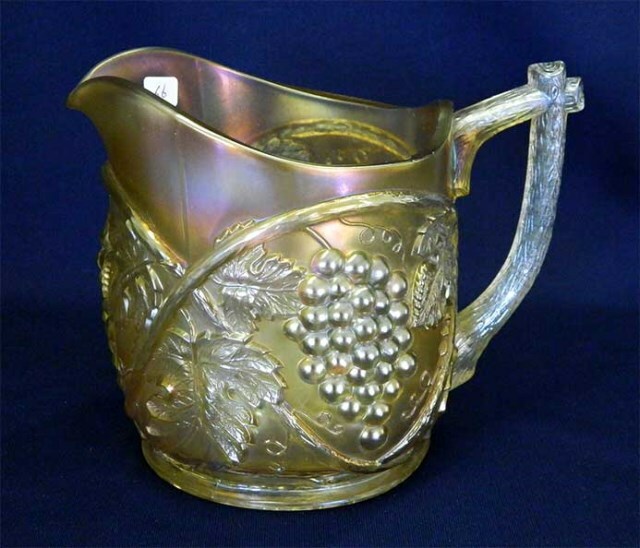 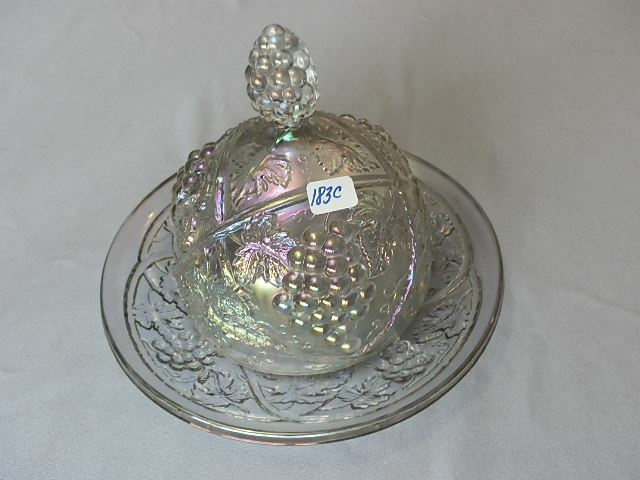 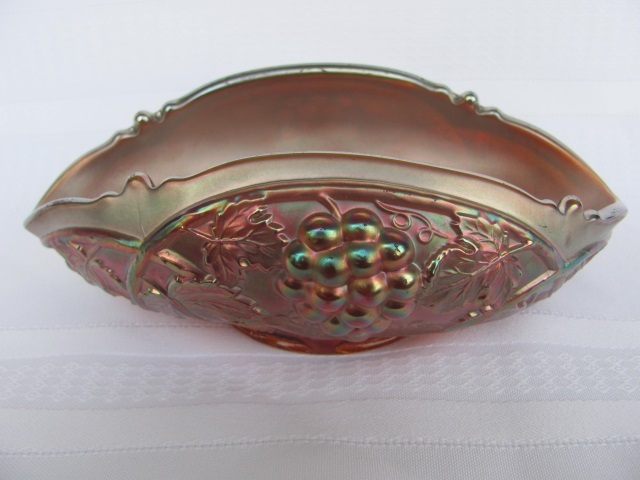 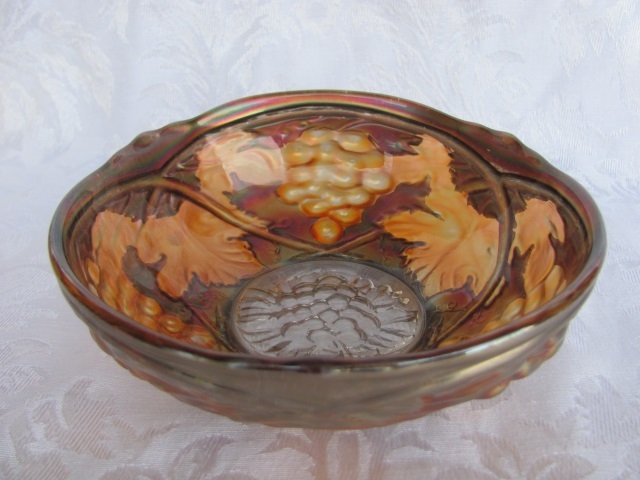 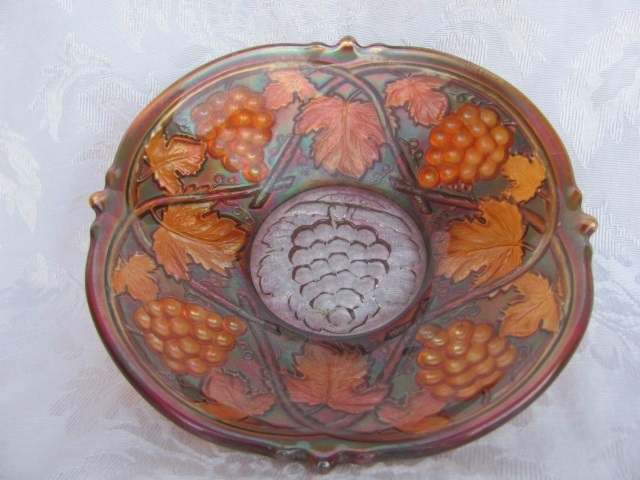 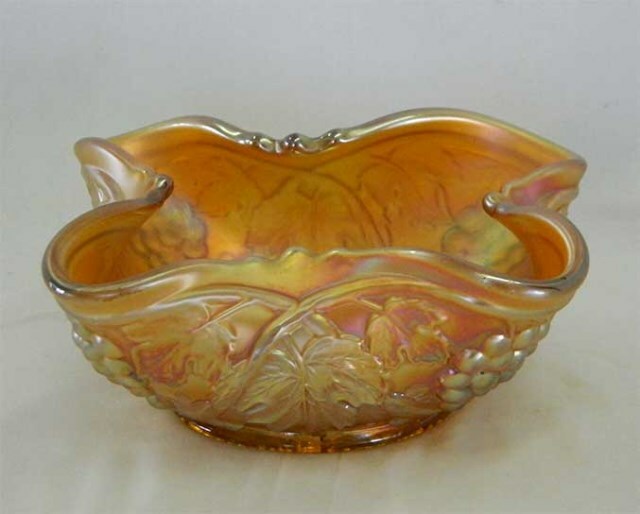 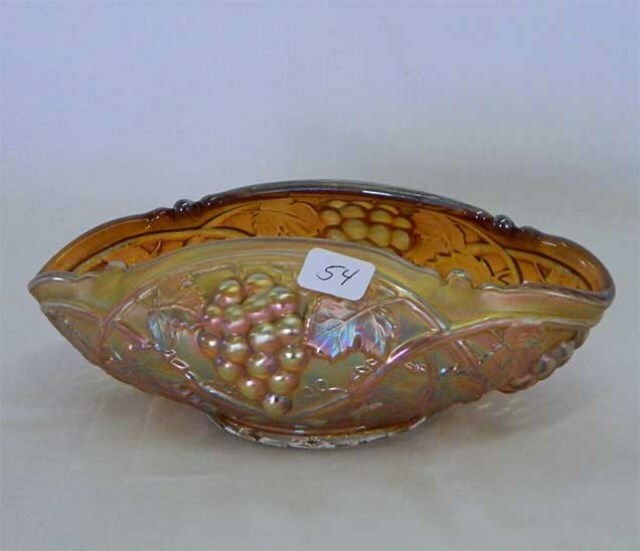 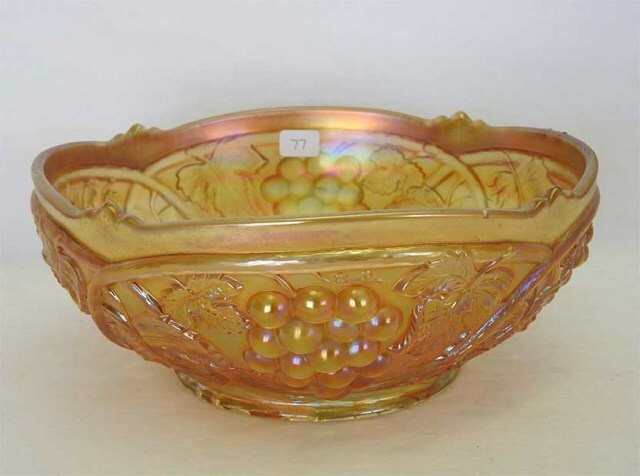 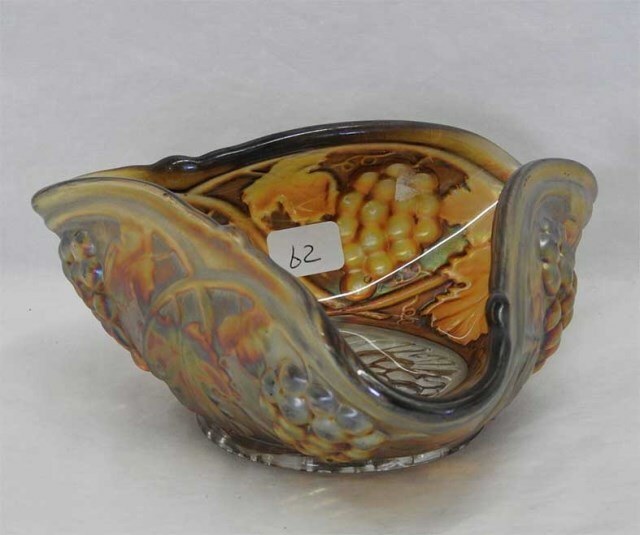 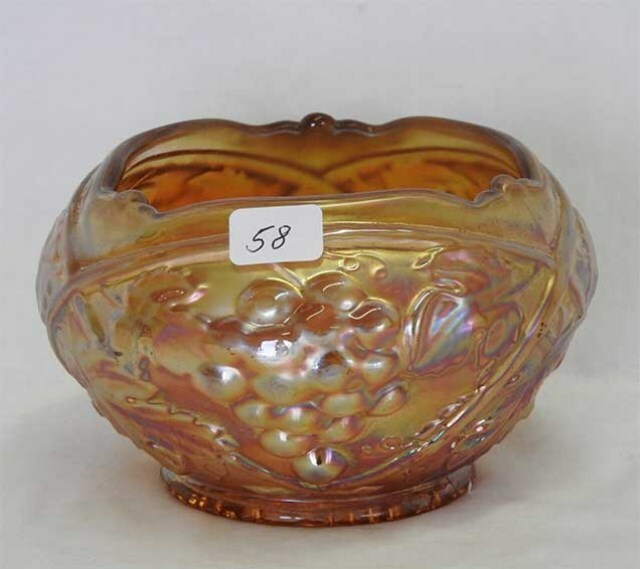 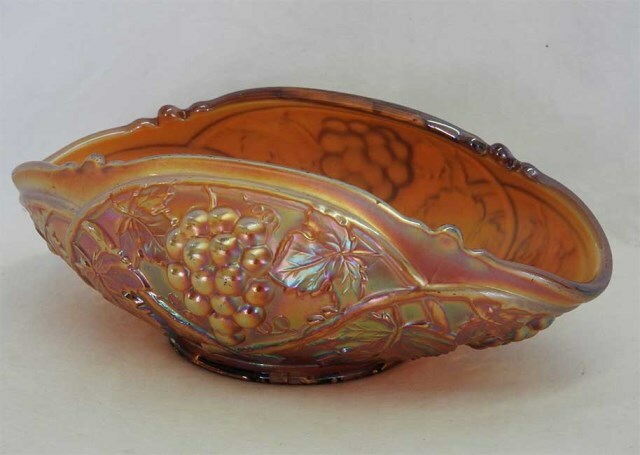 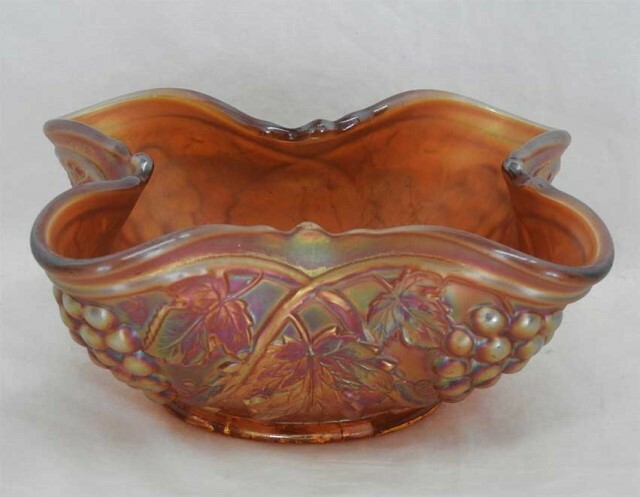 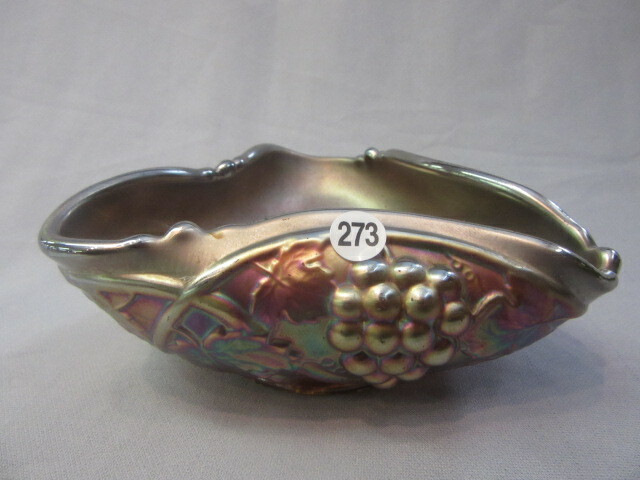 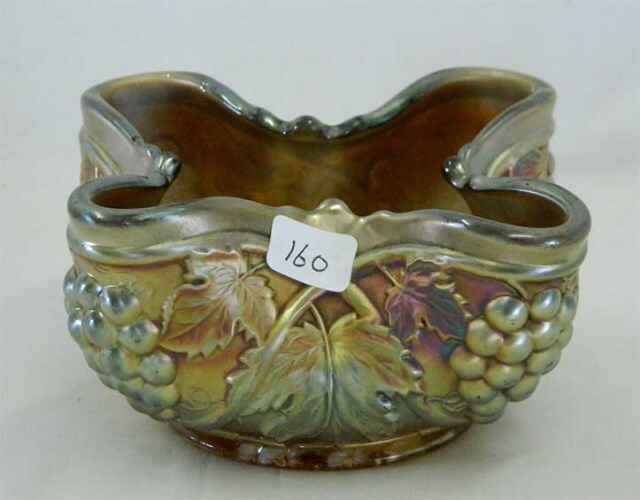 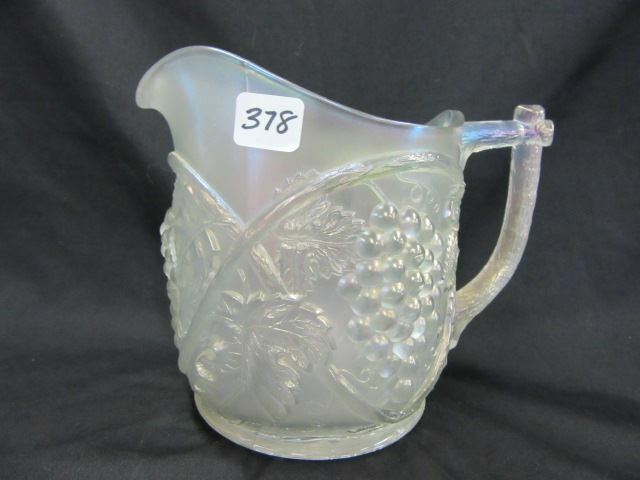 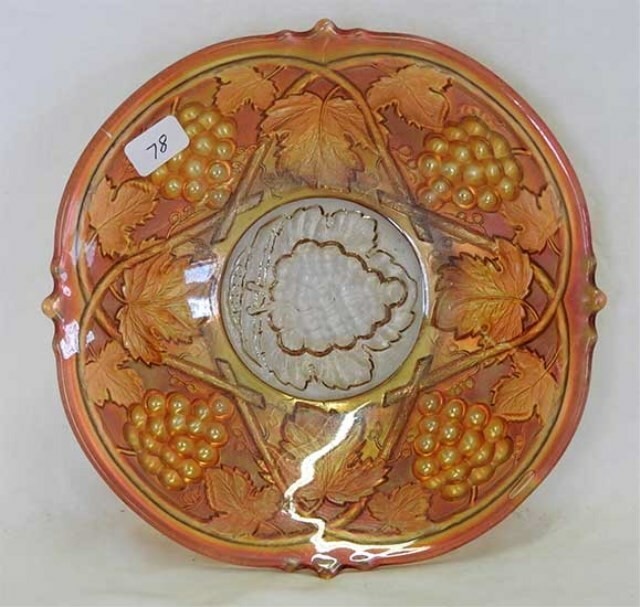 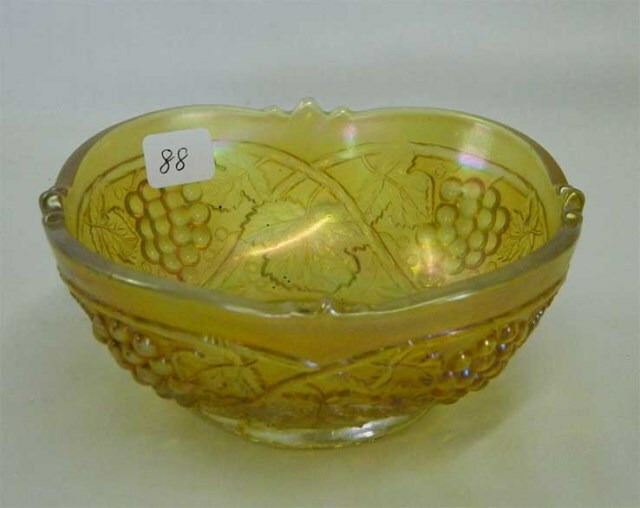 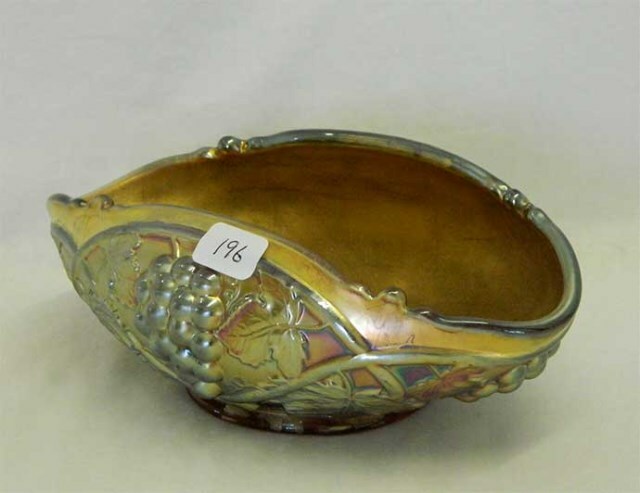 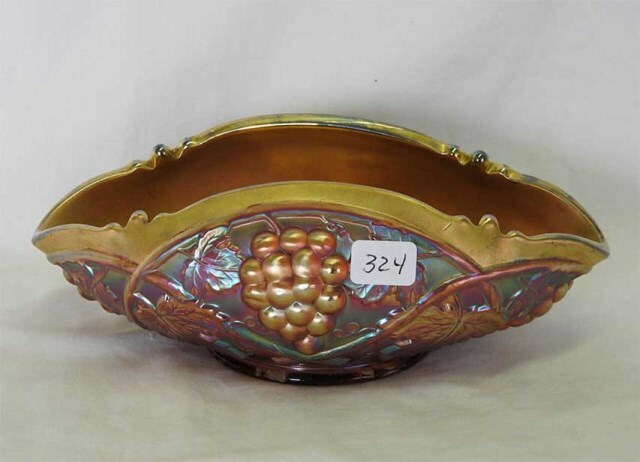 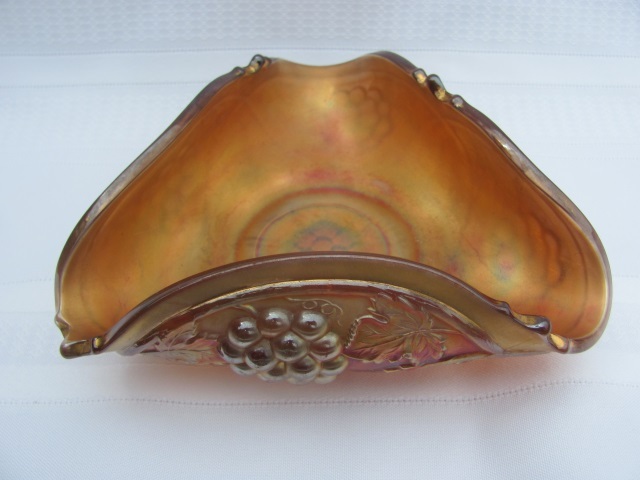 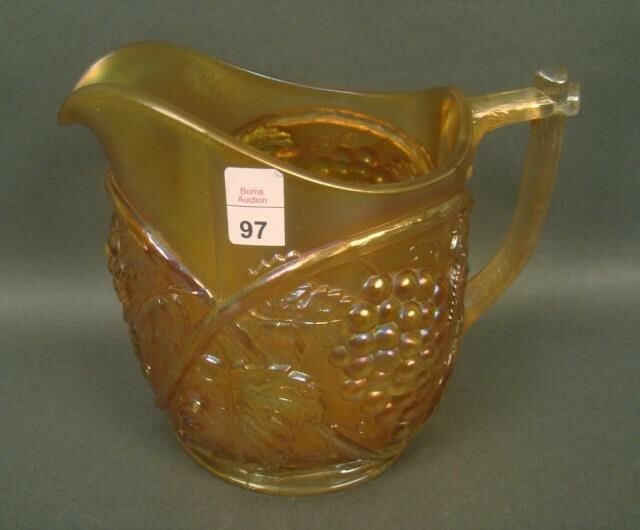 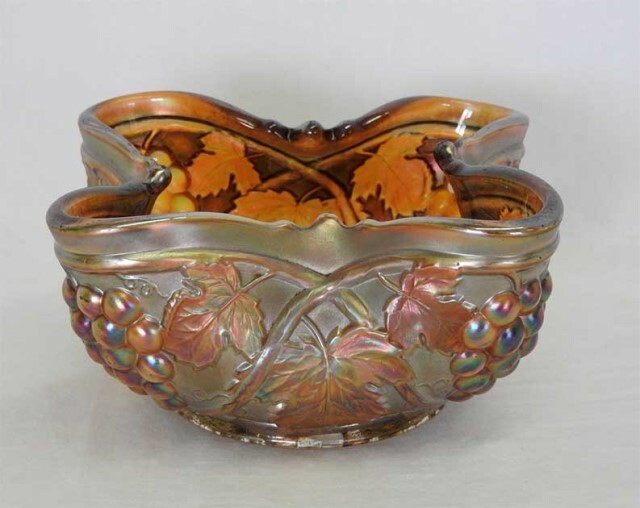 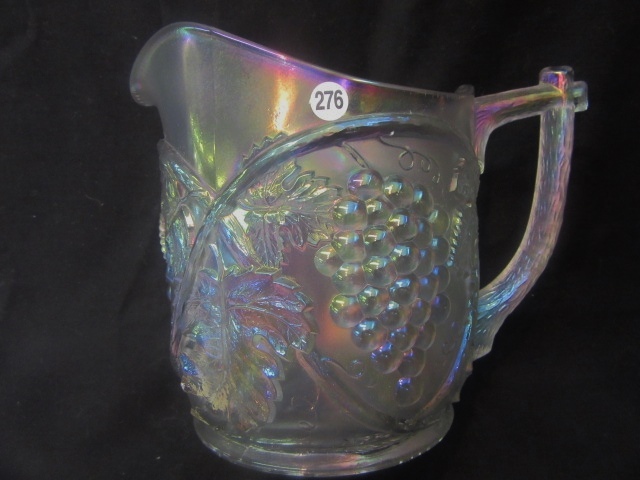 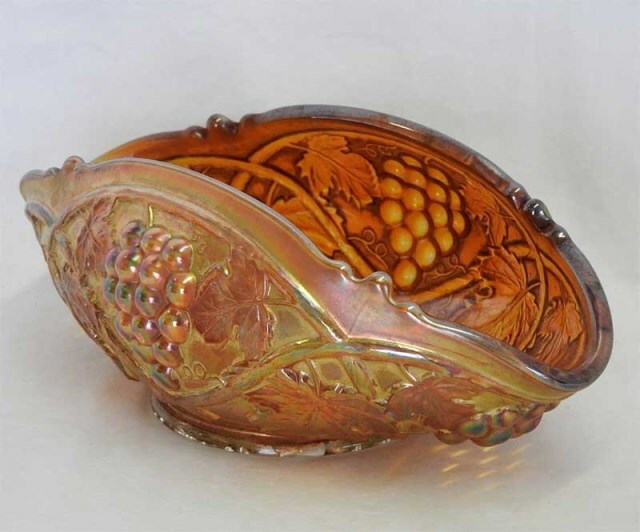 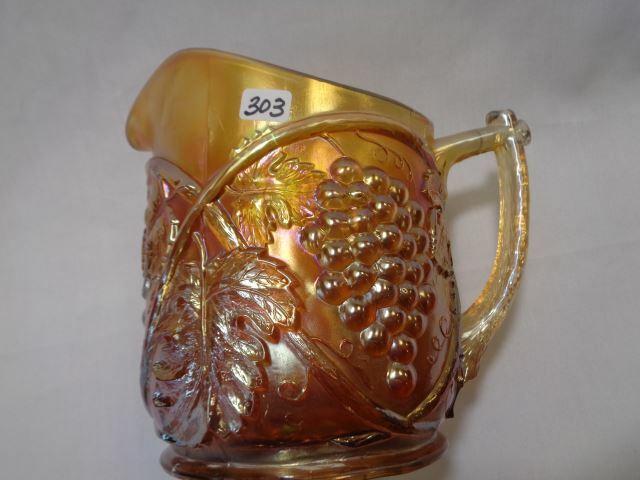 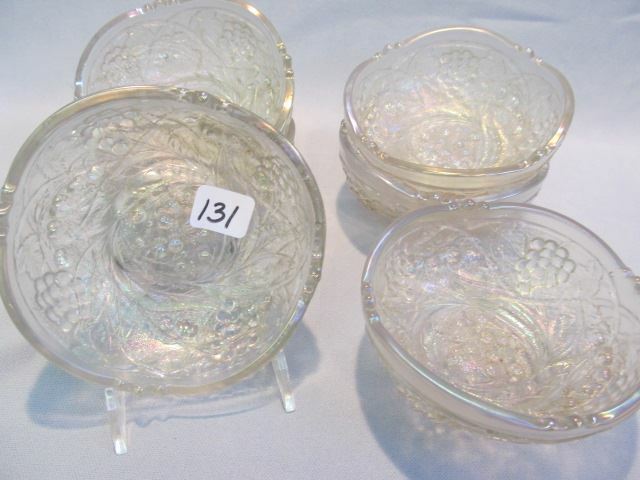 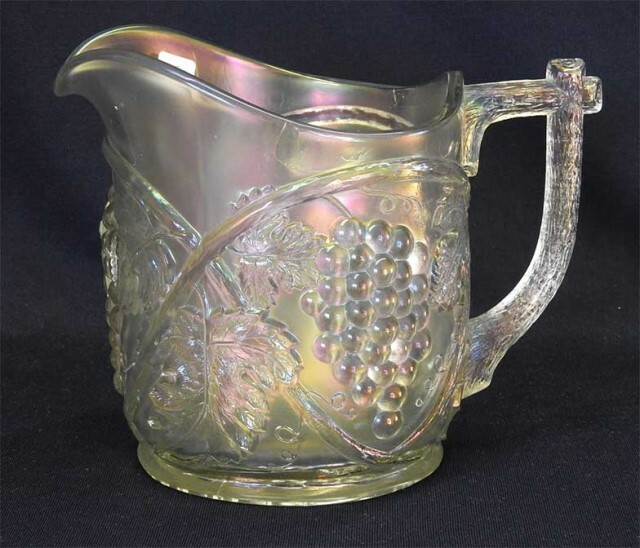 Palm Beach was the US Glass grape pattern. 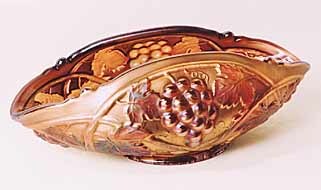 It is distinctive for the prominent vine that starts at the base and curves up to the top overlapping the adjoining vine. 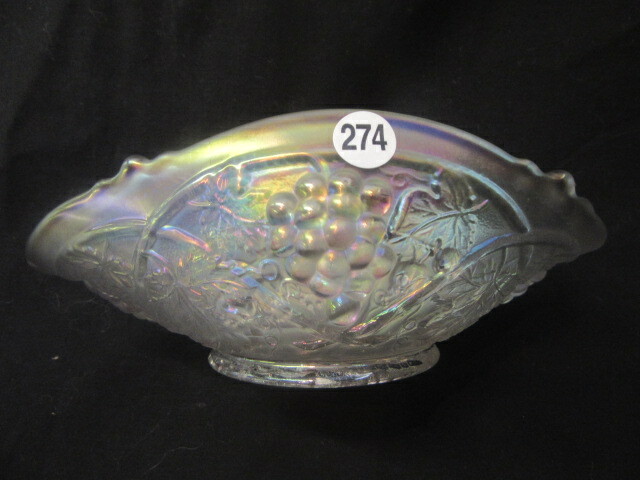 Above are a large berry bowl and a bowl that has been whimsied into a banana bowl. 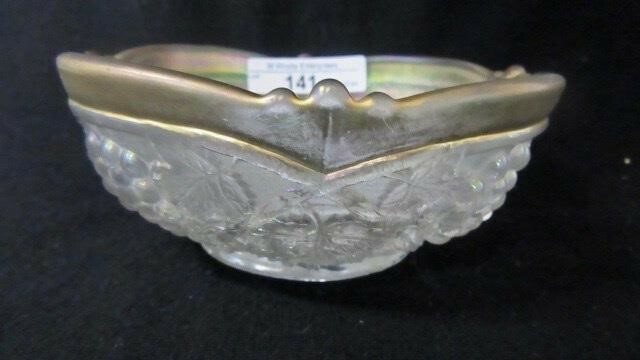 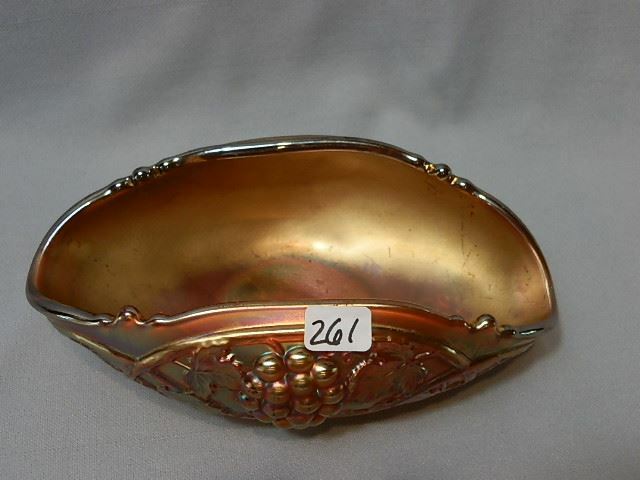 It has gold trim around the edge (often referred to as Goofus). 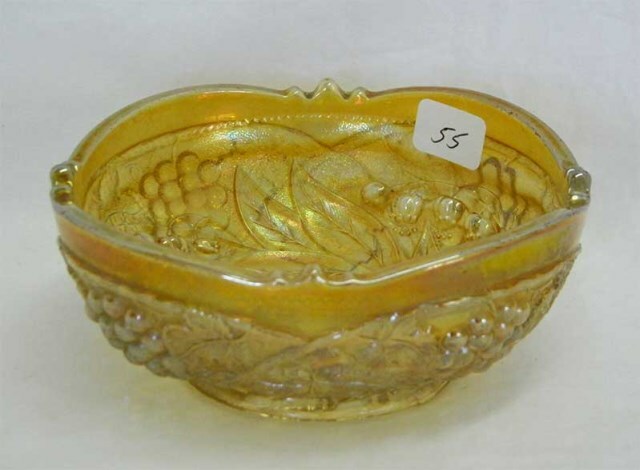 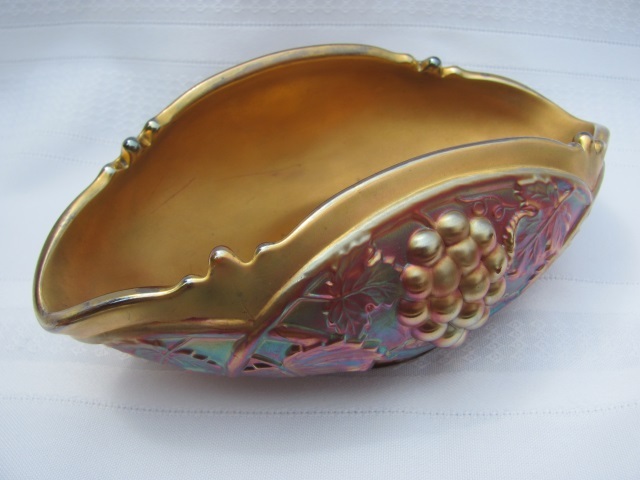 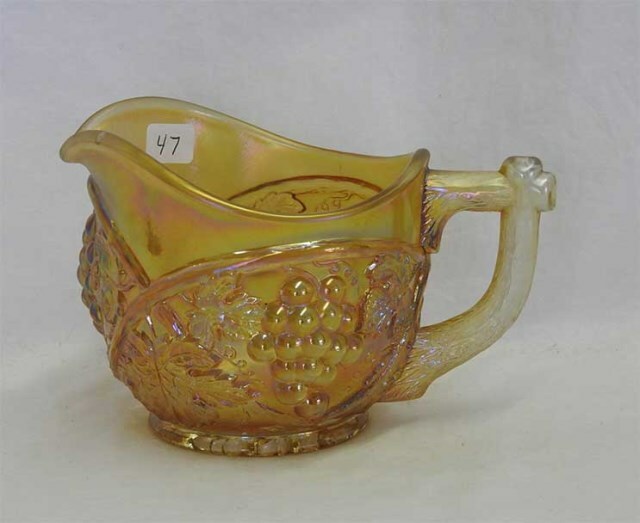 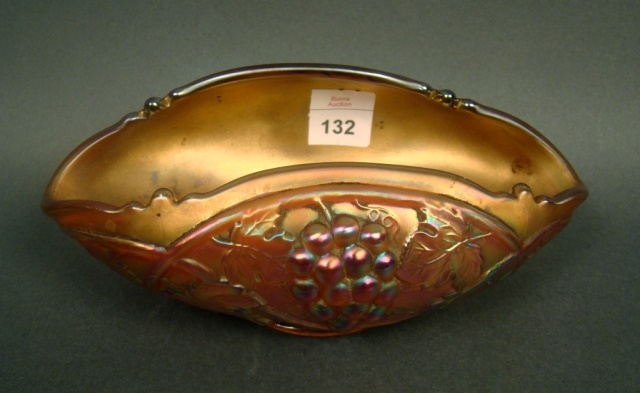 Bowls were often whimsied into interesting shapes; these banana bowls, tricorner, and squarish. 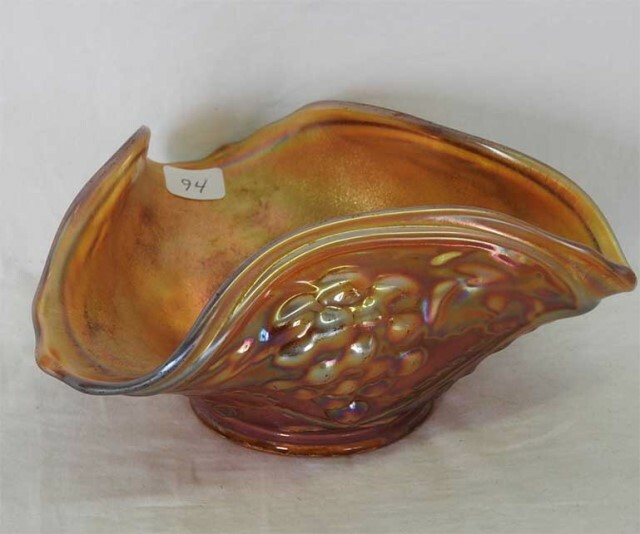 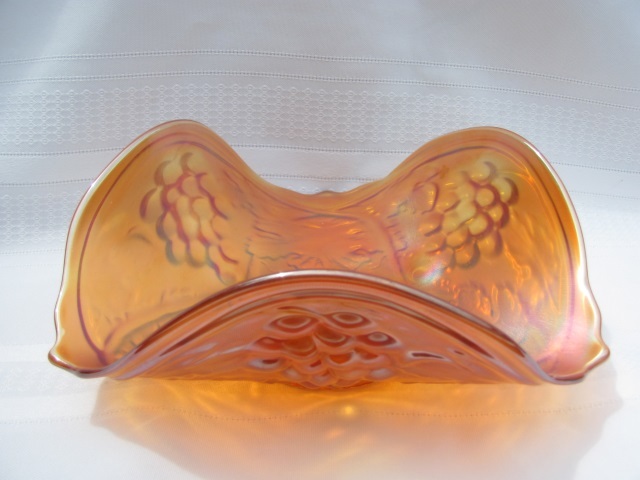 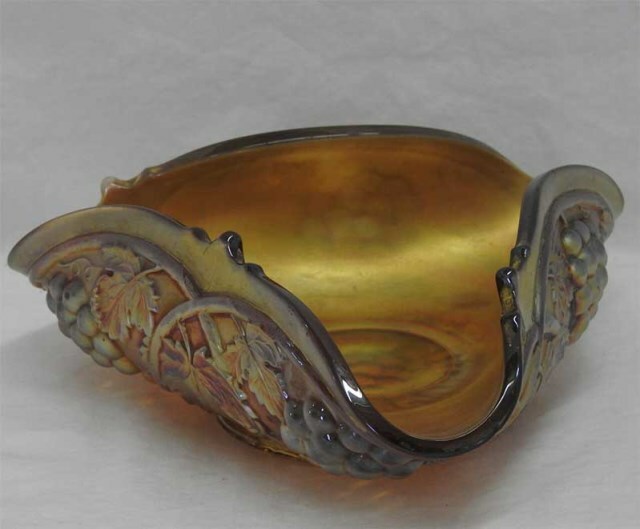 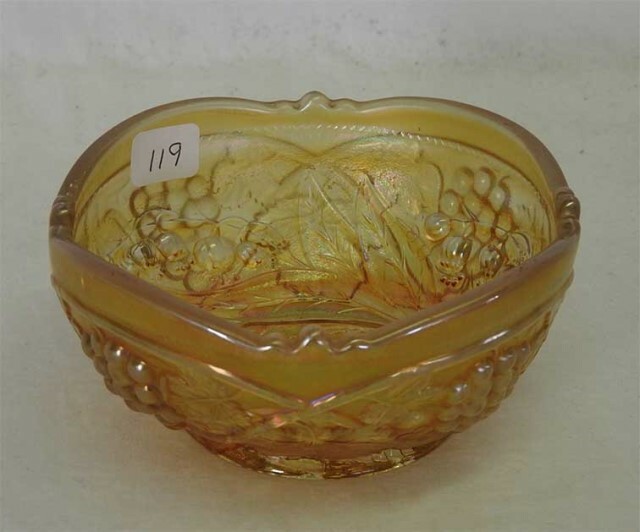 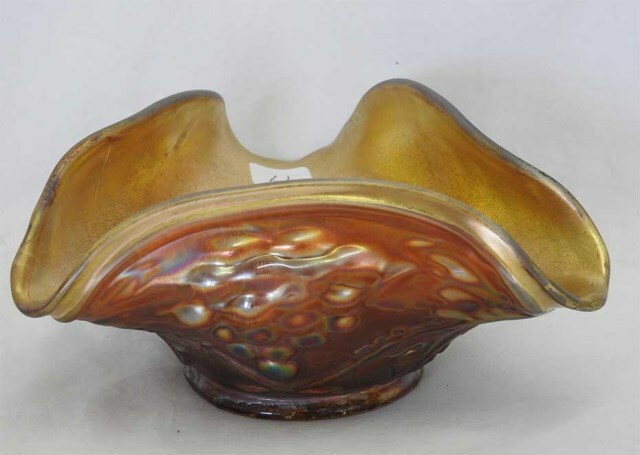 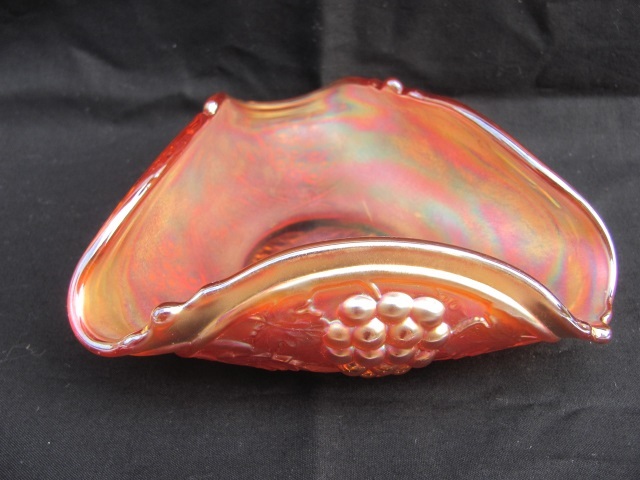 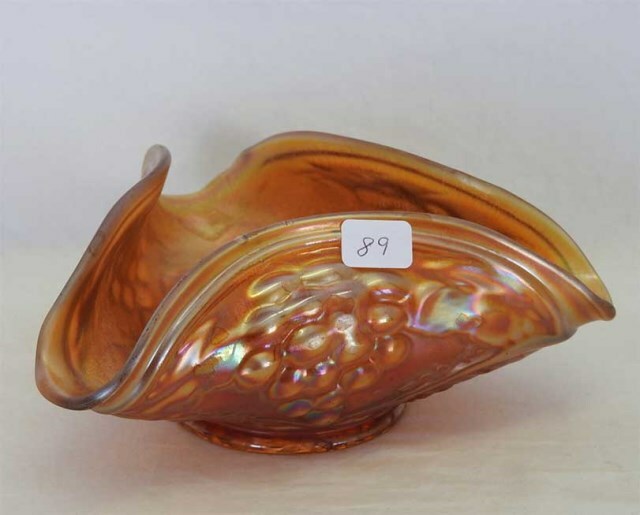 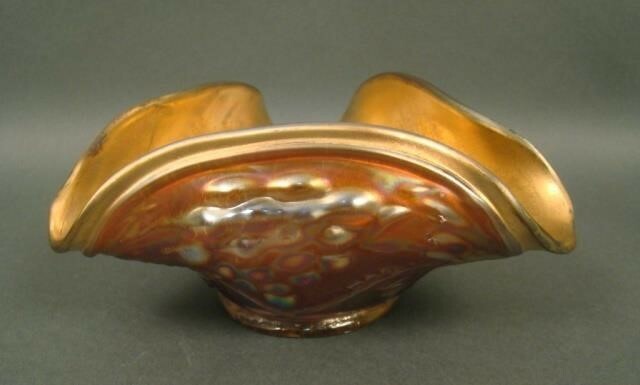 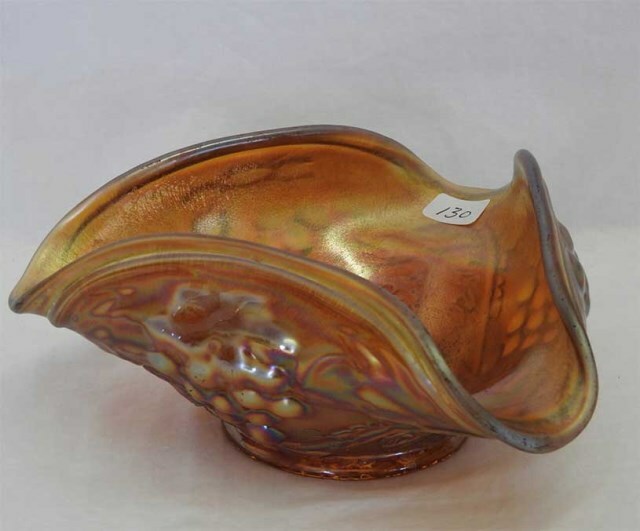 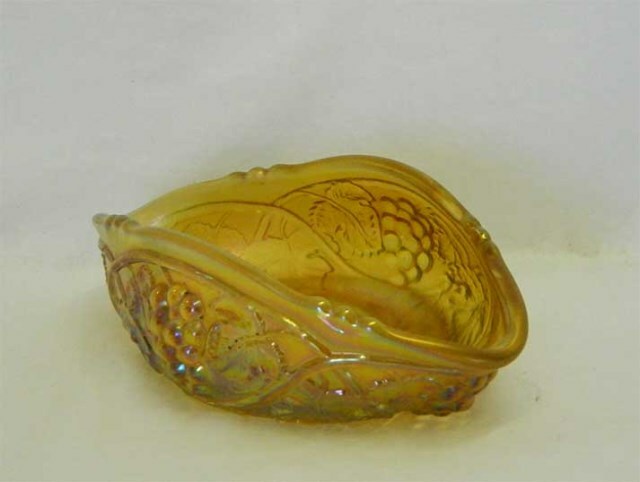 Many pieces are found in the color unique to US Glass called honey amber–similar to marigold but with a lustrous brown effect that looks like honey. 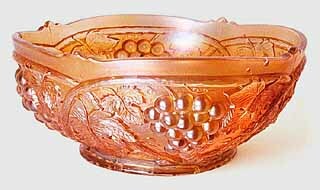 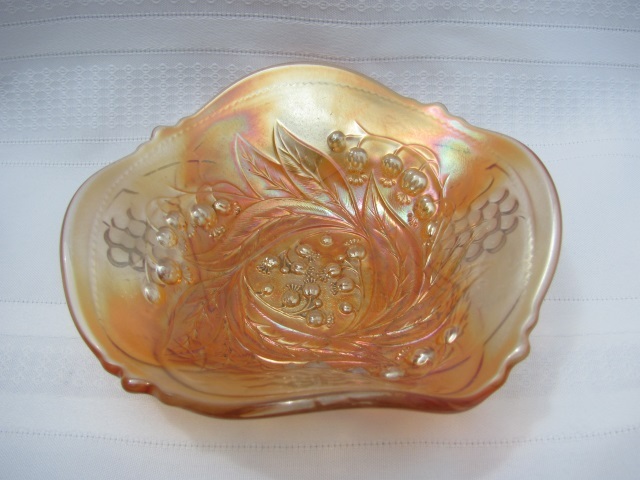 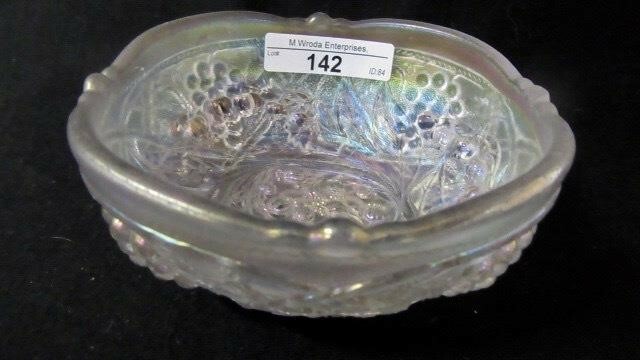 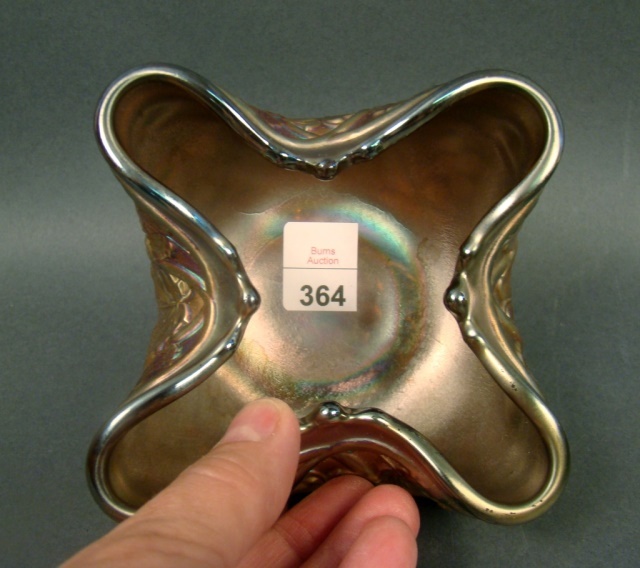 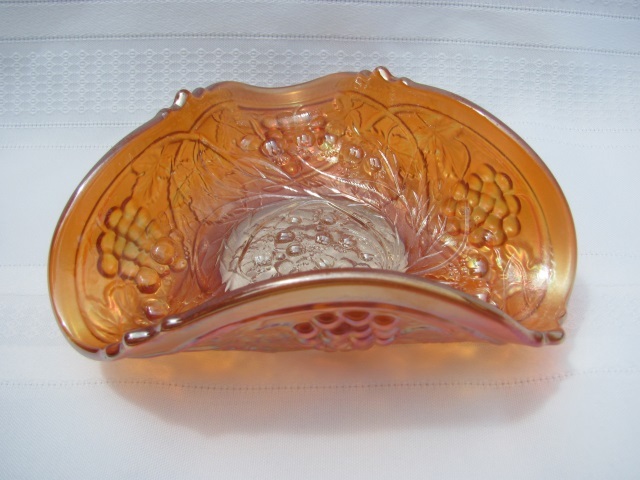 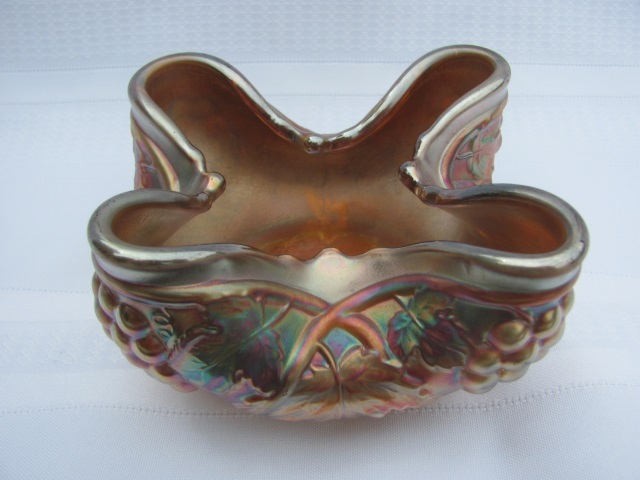 The small bowls are often whimsied into rosebowls. 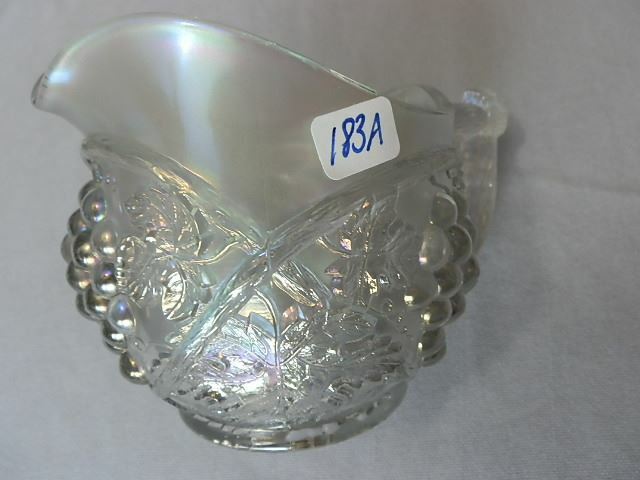 If they are cupped in far enough so that the top opening is quite small, they can be considered hair receivers. 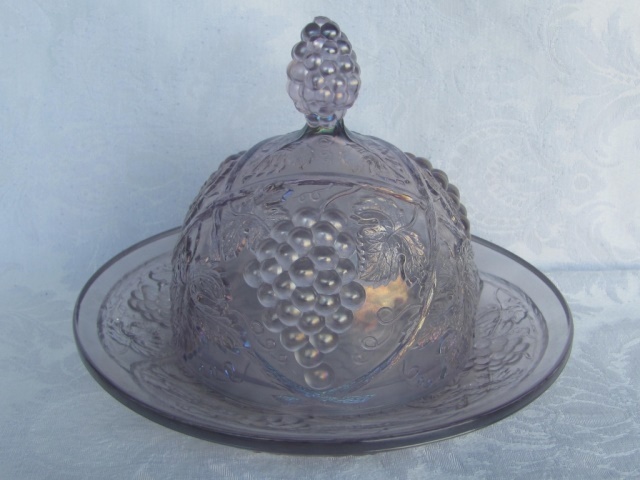 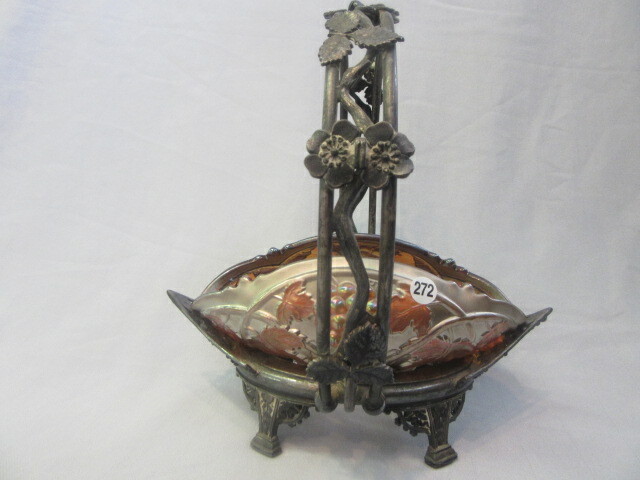 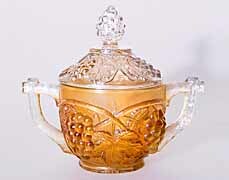 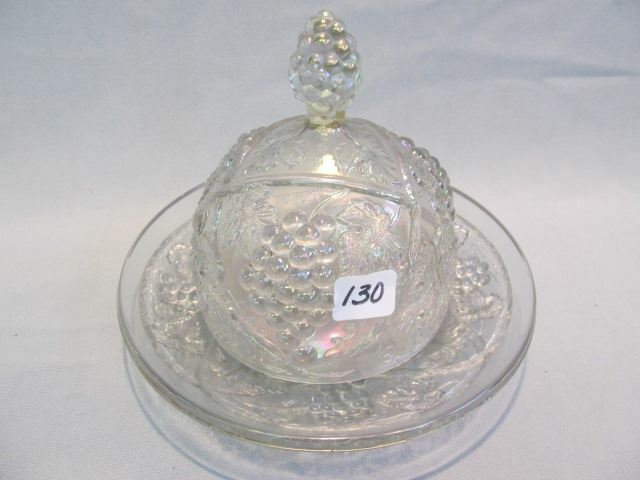 Handled table set pieces have twig-style handles and the butter dish and covered sugar have grape finials. 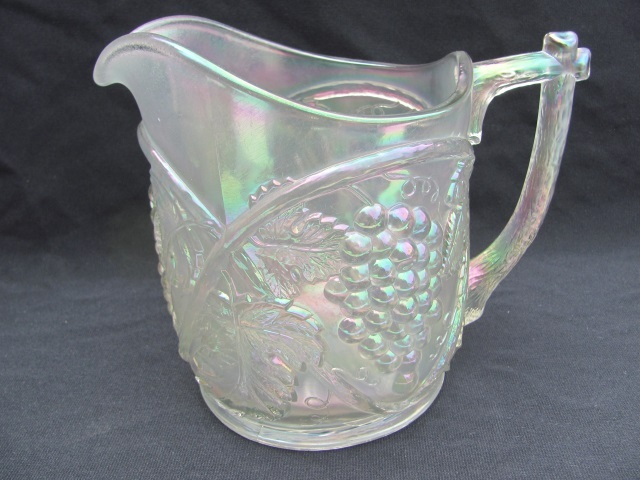 Above is a water pitcher in white. 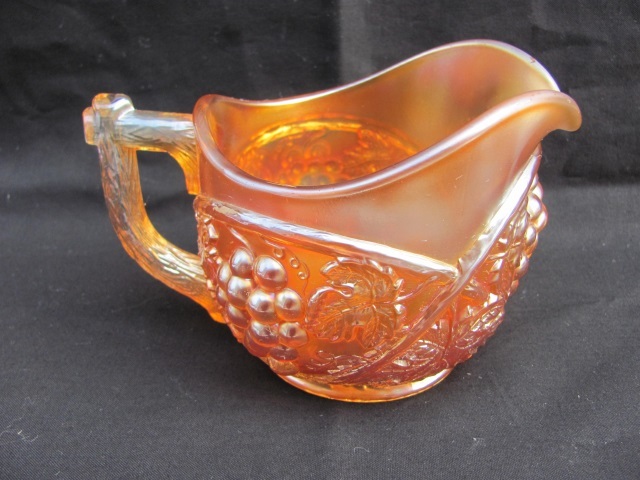 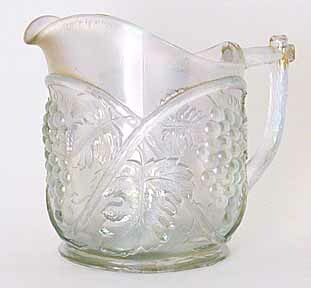 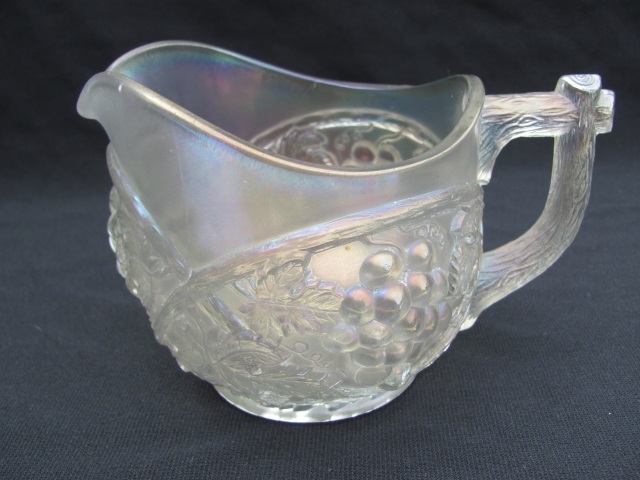 These are sometimes referred to as cider pitchers. 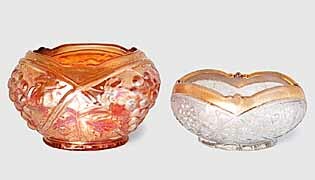 These are two of the several vases whimsied from various Palm Beach pieces. 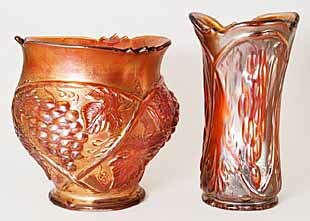 The vase on the left was made from an unknown shape, on the right from a spooner.